Police say Laura Smith was drunk and speeding when she lost control and crashed, leaving her 12-year-old son, Anthony, dead. 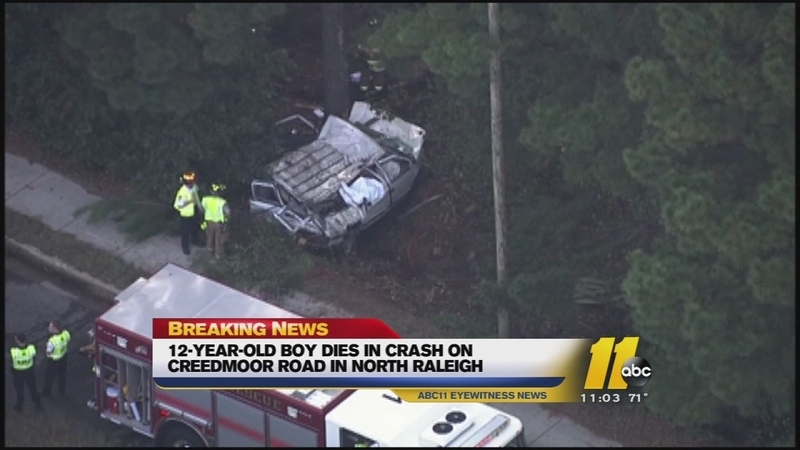 RALEIGH (WTVD) -- A mother is charged following a deadly accident in Raleigh Monday that took the life of her 12-year-old son. Police say around 3:45 p.m., a 1997 Chevrolet Suburban was headed southbound on Creedmoor Road, when the driver -- 49-year-old Laura Smith -- lost control, veered off the street and hit several trees, taking the bark clean off, before the vehicle rolled over. "The first thing I hear the tires make a noise and later a big, big noise, and I check in the yard and I saw the white car completely destroyed," described Maria Gomez, who could see the aftermath from her living room. Paramedics rushed Smith to the hospital with serious, but non-life threatening injuries. Her son Antony Smith, 12, was pronounced dead on the scene. Investigators said he was wearing a seat belt. An accident report released Tuesday shows police suspect Smith had a blood-alcohol level of .32. The legal limit in North Carolina is .08. An eyewitness who called 911 shortly after the accident, described the driver as reckless, "They were driving very erratically before they ran off the road, very erratic, I almost got hit by them." Smith was immediately charged with misdemeanor death by motor vehicle and exceeding a safe speed (74 mph). She is currently listed in serious condition at WakeMed. The investigation remains underway and more charges are expected. A fatal accident closed southbound lanes of Creedmoor Road between Sawmill Road and Lynn Road in Raleigh Monday afternoon. The tragedy sent shock waves through the north Raleigh neighborhood Monday when it happened. "We heard something go boom; sounded like half of a tree fell on the house or something," said eyewitness Brenda Walters, who owns part of the property where the vehicle landed. "Guys was running from across over here working on the house and said call 911 there's a wreck in your backyard, and said we think there's a fatality, and I called 911." Police shutdown the southbound lanes of Creedmoor Road between Sawmill Road and Lynn Road for about four hours before they re-opened it. "There were just a lot of emergency vehicles coming up the street, ambulances, policeman. I looked up and there were fire trucks on Creedmoor Road," said neighbor Mike Smith. Gomez says she prayed while she watched first responders work feverishly to try to free the trapped driver and passenger. "For 30 minutes I saw the lady. I prayed for her because I'm not sure she [was] alive or not." "It just tore my heart apart. I thought about all of the families," said Walters. "My prayers and thoughts go out to the family. I mean we just really feel for them," added Smith.